Athlone Institute of Technology has unveiled a plaque dedicated to the life and legacy of the late John Goor whose company JL Goor has supplied the Irish polymer industry with machinery, equipment and polymer materials for more than 30 years. The ceremony, which took place in the institute’s state-of-the-art Engineering and Informatics facility, celebrated the Wicklow man’s significant contributions to the higher education landscape, all of which have left an indelible mark on the Irish plastics industry. Mr Goor also used his influence, both as a businessman and a member of the Institute of Materials (IoM), to attract influential people to speak at the IoM’s annual conference with the view to informing attendees, many of them AIT polymer students, about new technologies and developments within the field. “John was invested in cultivating the next crop of graduate materials engineers to ensure the continued success and growth of the plastics industry. His considerable expertise and industry experience meant that he was very good at identifying gaps in knowledge and so helped us develop course content to fill these gaps,” Dr Lyons explained. At the time, Athlone Institute of Technology was one of the only colleges in the country specialising in polymer engineering and supplying a burgeoning industry with a steady pipeline of talented, technically-minded graduates. Conscious of this, Mr Goor created the JL Goor Scholarship Fund, supporting students throughout the second, third and fourth year of their degree with a bursary, access to equipment and mentorship. “John was an extremely generous man with a strong altruistic core. His legacy will live on through his family, this institute and the students whose lives he was instrumental in shaping In naming this theatre and unveiling his plaque, we wish to acknowledge all that John has achieved throughout his life and for his part in helping make Athlone Institute of Technology what it is today - an institute at the forefront of polymer research and development,” Dr Lyons said. 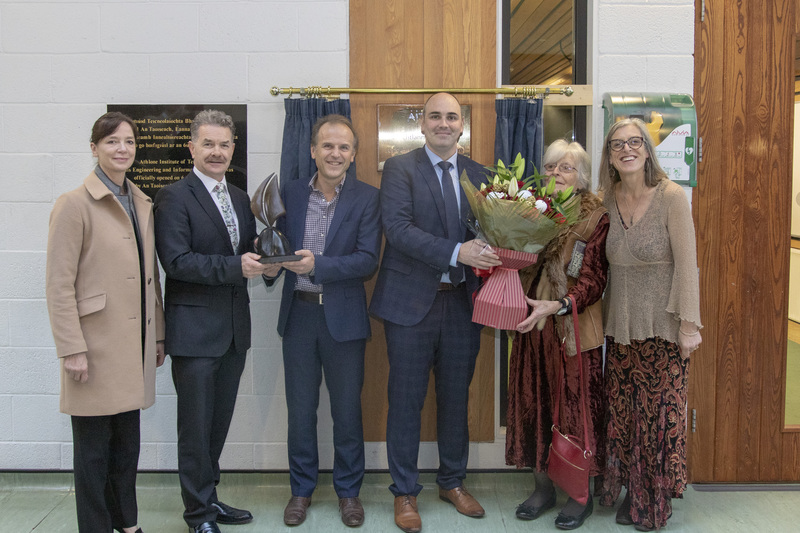 JL Goor Materials Ltd Managing Director Gearoid Clarke was also in attendance to see the unveiling of the eponymous plaque and lecture theatre. A graduate of Athlone Institute of Technology’s Polymer Engineering degree, Mr Clarke met the Goors in 1994 following an introduction from Paul Blackie, one of the institute’s polymer engineering lecturers. From the encounter sprang an employment opportunity concerning a survey of resin requirements in industry – which ultimately led to the formation of JL Goor Materials LTD and a long-lasting friendship with the Goor family. “John’s passion and willingness to share his extensive industry knowledge and years of experience is, in large part, why we stand here today. His relationship with Athlone Institute of Technology was extremely important to him and consequently remains extremely important to JL Goor today. Given the institute’s pivotal role in the development of the Irish polymer industry and in producing the next generation of polymer engineers, this is a wonderful way to honour John, ensuring that his legacy lives on through those whose lives he has touched,” Mr Clarke said. My Goor’s wife and family attended the unveiling ceremony, as did key members of the Irish polymer industry, such as Declan O’Rourke (Longford Tool and Plastics), Catherine Collins (First Polymer Training) and former JL Goor Scholarship recipients, many of whom now work in industry themselves. Commemorating the occasion, the Goor family were presented with an engraved bog oak sculpture from the Celtic Roots studio in Ballinahown. Athlone Institute of Technology is a modern and dynamic HEI distinguished by outstanding learner experience, international focus and applied research and innovation. Awarded Sunday Times Institute of Technology of the Year 2018, AIT is currently ranked 8th nationally of all HEIs in the league table comprising of Irish Universities and IoT’s. Athlone Institute of Technology boasts a wide array of courses in the Faculties of Engineering and Informatics, Business and Hospitality, and Science and Health. For the full list of courses on offer at Athlone Institute of Technology click here.